Get groovy with this snazzy “ringer” style T-Shirt featuring a character from the “Afro Goblin and Chums” cartoon show! 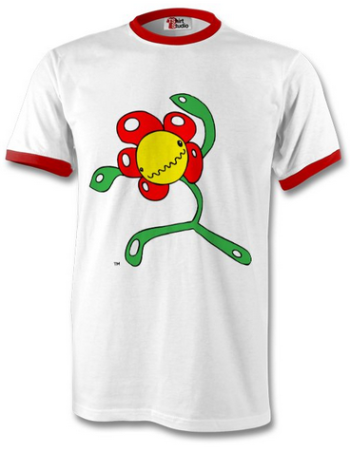 – Your favourite squiggly mouthed mischievous flower Lenny! Features complimentary red sleeve and neckline. Please use the size guide image below to find the right size for you. 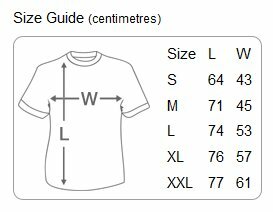 The easiest way to check this is if you take a T shirt that you wear and lay it out on a flat surface and take 2 measurements (under the arms across, excluding the sleeves and from the top to bottom as shown by the arrows in the picture) then pick the size that most closely matches the size of your T shirt. Please note the T shirts are 100% cotton so please allow for shrinkage. A cool wash at 30 degrees Celsius is recommended.